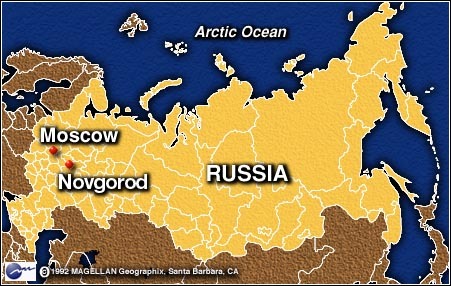 NOVGOROD, Russia (CNN) -- Some of the children of Russia's orphanages don't sound like children, move like children or look like children. The country's orphanages have been hard hit by the government's financial crisis -- so hard that last week, the New York-based Human Rights Watch called the conditions "inhuman." Human Rights Watch found the Russian orphanage system condemns children "to a life of deprivation and cruelty." More than 200,000 children are classified as being "without parental care" and placed in orphanages, though as many as 95 percent of them still have a living parent, the organization concluded. For children like Vitaly, a 6-year-old in Novgorod, six hours northwest of Moscow by road, that means bread soup for lunch. Staff members at the orphanage in Novgorod say the children don't get enough calories. Vitaly needs protein, but seldom gets any. Neither does he see his parents, both still alive and teaching school in town. 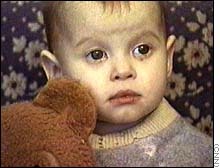 Like many parents of disabled children in Russia, they "gave up" Vitaly to an orphanage to "try again" to have a healthy child. Now those orphanages lack the resources to meet their basic needs. And conditions are worse the farther you get from Moscow. The children of Novgorod's Orphanage Number 3 have no coats to go outside in the winter, and no shoes to go outside in the summer. Now food is running low. "This orphanage is supposed to get 12 cents a day to feed each child. This month they've gotten nothing," said Irina Vodkailo, the orphanage's director. "What we have now is powdered milk and some grain -- enough for three days, not more." The children stay in bed all day, or sit in a playpen, wet. According to staff members, few survive to age 14. The leading cause of death in Orphanage Number 3 is pneumonia. The Russian government has publicly announced steps to improve conditions in its orphanages. But Human Rights watch concluded the proclamations have yielded few results. "The reaction of the Russian authorities to the critique of their orphanages has been to block access to the institutions; punish or threaten to fire workers if they speak about abuses; and, in some instances, pardon those who are responsible for the wrongdoing," the group's report found. Correspondent Steve Harrigan contributed to this report.